In fourteen interviews with new Americans from Latin America, Asia, Europe, Africa, and the Caribbean, Marina Budhos found many remarkable stories. Muslim girls in New York struggling between rigid home rules and high school pressures. Russians in L.A. testing out the strangeness of American teenage customs. Hmong boys in Wisconsin trying to be true to two unfamiliar cultures. But when she met young people whose experience matched her Guyanese father's, Budhos changed from being a reporter to being a fellow traveler between worlds. 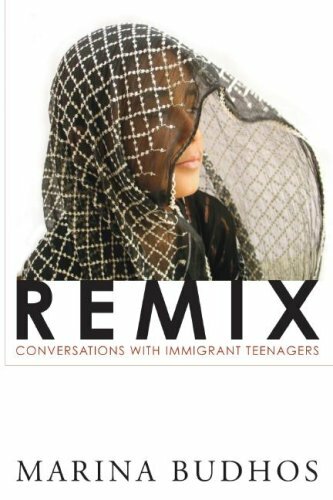 Remix faces two ways: it exposes the too-often hidden world of immigrants, and it also reveals, through their insightful eyes, what it means to be a teenager in America. Marina Budhos is an award-winning reporter and reviewer for such publications as The Nation, Dissent, and Ms. Her latest adult novel, The Professor of Light, centers on immigrant themes. She grew up in a multi-racial immigrant family, with ties to two culturally different parts of the world. She lives with her husband in New York City. About Marina Budhos (Author) : Marina Budhos is a published author of young adult books. Published credits of Marina Budhos include Ask Me No Questions, Remix: Conversations with Immigrant Teenagers.